That sounds like a carefully developed media persona, right? Like ole’ Scotty Boras put him through some rigorous PR training? But as far as I know from working with him in Omaha, he actually means it. Again, these things were said in the dugout, in conversation with a teammate. There were no cameras or microphones, and he had no way of knowing that a nosy blogger would be quoting him. So I’m pretty sure this is actually how Mike Mosutakas feels. That’s why I tell people that I have never met a ballplayer like him. That’s why I can promise anyone in baseball who hasn’t worked with him before that they’re going to love having him around. That’s why I wrote this really terrible piece last year about how all of a sudden, I see what a difference a guy’s “clubhouse presence” can make. I still worry about Moose’s discipline. 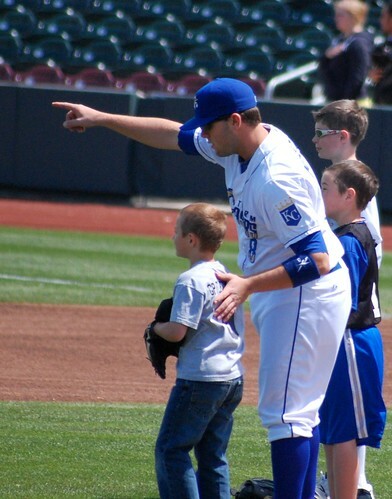 He doesn’t have anywhere near as good of an eye for the strike zone as his bestie Hosmer. And I worry about his defense. I definitely saw him beat himself up over all the sloppy defensive miscues he had early in the season in Omaha. But I hope so desperately that he can succeed in spite of those concerns, because I want as many Kansas City fans as possible to love one of the only top prospects in all of baseball who will genuinely love them back. The game has plenty of fame-grubbing glory boys. I’ll take this kind of campy, gushing self-awareness any day. And I love that last night, Minda. Kind of says it all. I’m uncertain about Moustakas’ attitude and demeanor, it makes me happy to read this sort of thing about him. Absolutely awesome post. I’m pulling for this guy big time. Met him at the FanFest and he was one of the best people I met. I am hoping for the best for him.